The Caproni Ca.3 was an Italian heavy bomber that saw extensive use against the Central Powers forces. It was used from 1916 until the end of war by Italy, United Kingdom, France and USA. One of the most effective bombers of any air force during WWI, the Ca.3 was a wooden three-engine biplane, armed with twin 6.5 mm or 7.7 mm machine guns and 1,760 lbs of bombs. 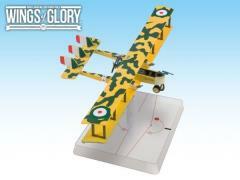 Special Pack is a ready-to-play large size model, painted and assembled, 100% compatible with any other WW1 Wings of Glory game product. In each pack you will find all you need to play with the airplane: a special base with gaming stats, a variable altitude flying stand, and a specific deck of maneuver cards, as well as specific rules and components necessary to use the airplane.